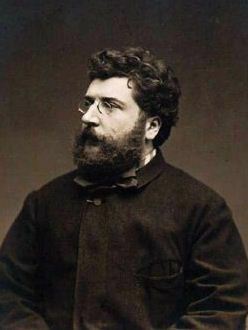 In 1848 at the age of 9 Bizet was admitted into the Paris Conservatory. In 1863 at the age of 24 he wrote his first major work, The Pearl Fishers. In 1870 at the age of 31, although exempt, Bizet enlisted in the National Guard to fight in the Franco-Prussian war. In 1875 he wrote his masterpiece Carmen. He died from a heart attack only a few months after the first performance of Carmen at the age of 36. He has always lived in or near Paris with the exception of a few years in Rome.